The coordinating committee settled on an initial five year timeframe of existence during which several short term goals will need to be identified. Several sub-activities (subgroups) of the coordinating committee were identified and leads for each assigned. A key discussion related to affiliation of the working group with scientific organizations. Clearly, affiliation with established, relevant scientific organizations will elevate the profile, interest and credibility of the working group and hopefully stimulate participation. A key affiliation immediately recognized was with the Pedology Sub-committee of the Canadian Society of Soil Science (CSSS). The creation of the working group was endorsed by the sub-committee on May 16th during the annual meetings in Kamloops. The committee also recognized the need to go beyond the CSSS (which is perceived by many as having an agricultural focus) to organizations like the Canadian Institute of Forestry. Given the support and interest from CSSS members, we will explore affiliation options with other relevant scientific organizations across the country. To get a sense of the scale and scope of the Canadian DSM community, to conduct an inventory of projects, expertise and interest in DSM that currently exist in Canada. To define short term and five-year goals for the working group based on the needs (at a range of scales) of governments and others for digital soil information ( link to the document on activities). In conjunction with the above items, to develop the sub-activity areas identified by the coordinating committee including the formation of a technical team, evaluating potential fundraising opportunities, examining needs related to governance of the working group (i.e. how best to coordinate the interests of government, university and private sector participants) and promote the group through effective communication primarily through a web presence. Set up a platform for communication and sharing so that we (and anyone else who is interested) can collaborate to organise ourselves and jointly agree on key objectives and further activities. Get us all using this platform consistently and recruiting others to join and use it too. Jointly create and agree on a document that sets out the agreed short and long terms goals of the group and establishes norms and rules for interaction and contribution. Find someone to lead a process to identify and contact holders of soil field and lab data (through some combination of targeted enquiry and self reporting) and then itemise their holdings. If possible, acquire original holdings in their raw state, if owners are willing to make them available. Store these as is on a DropBox style repository. Jointly create and agree on what measures we feel are needed to assess the quality of any contribution (profile data, covariate data, prediction map, platform) and agree on metrics and standards that contributions need to report so that they can be evaluated in terms of quality and usability. If possible, create a quality control data set of profile observations that can be used to evaluate the accuracy and quality of predictions made for anywhere in Canada (by province, region or country-wide). 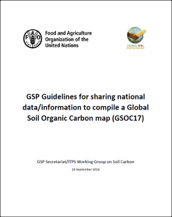 In response to a call from the UN-Food and Agriculture Program for countries to contribute to a new global soil organic carbon map, the DSM working group has agreed to take the lead in the preparation and delivery of the Canadian contribute to this global initiative. Information and FAO guidelines on the project. In the coming weeks we will seek volunteers to help with data compilation, mapping, harmonization, validation and the many other tasks that go with creating a digital soil map. Our expectation at this time is that the S&T team will direct several methods to prepare the map that we will compare. Presumably our best product will be the one we submit. Stay tuned!